It only takes a few days or weeks for a clean kitchen pantry to become messy. The clutter contained behind a closed door helps us keep the mess “out of sight, out of mind”…until we open the door to grab something. However, the mess alone isn’t as bad as realizing how much food has expired due to forgetting we even had it because it was hidden underneath other items. An easy way to save on groceries is to keep an organized pantry all the time. It’s easy to keep up with exactly what you have at home and what you need at the store. 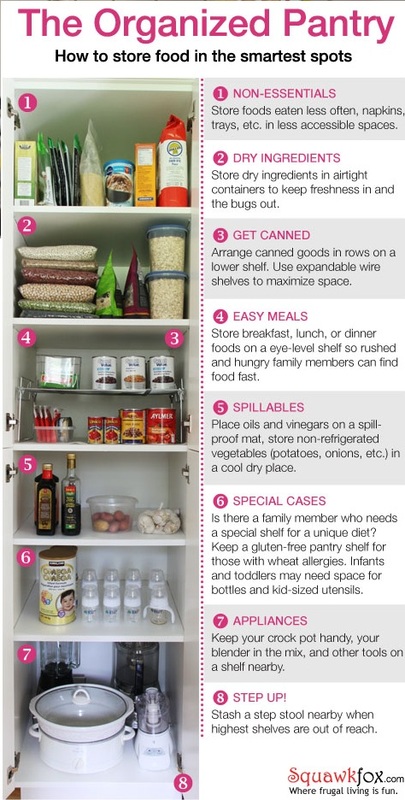 Today, Betenbough Homes shares creative pantry organization tips to help homeowners save money. For less than $12 at Walmart, purchase an over-the-door shoe organizer to hang on your pantry door. 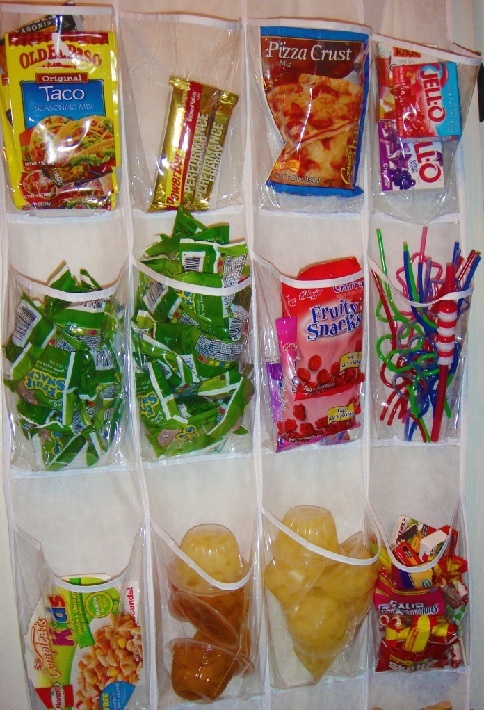 Throw away the boxes and store snacks and other items in each shoe slot. A good side note is to store the healthy snacks down low if there are little ones in the house. That way they will be more likely to reach for those when they are hungry. An office magazine rack shouldn’t be limited to magazines only. 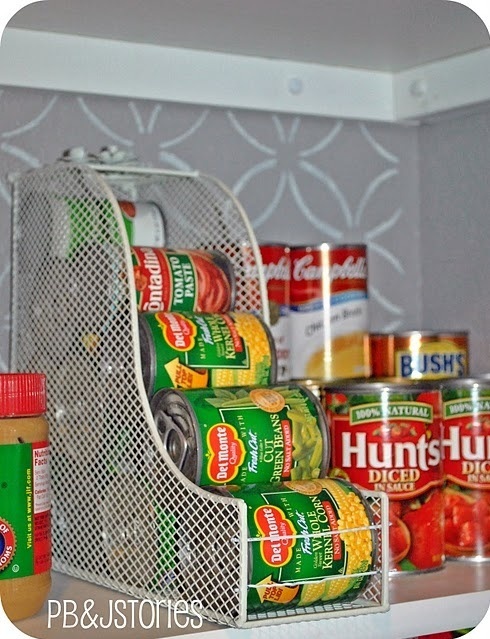 Ever think about storing canned goods such as green beans and corn in the rack? This idea is a perfect space saver! 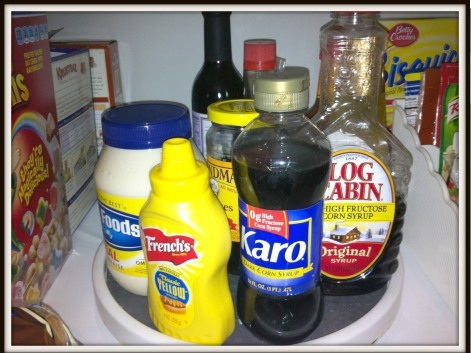 For condiments, a good organization tip would be to purchase a small Lazy Susan. It takes up less space you can see what you have on the turntable. 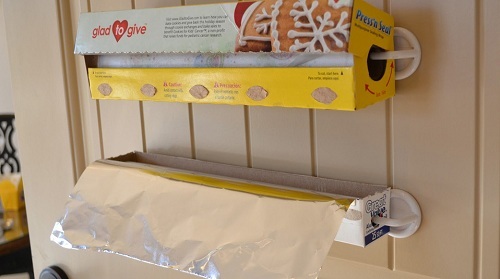 A good way to organize foil and plastic wrap is with adhesive hooks. Place the hooks on the inside of either the pantry door or a cabinet door about 10 inches apart, and wedge the rolls between them. Need a spot for packets like Kool-Aid, gravy, oatmeal, or hot chocolate? 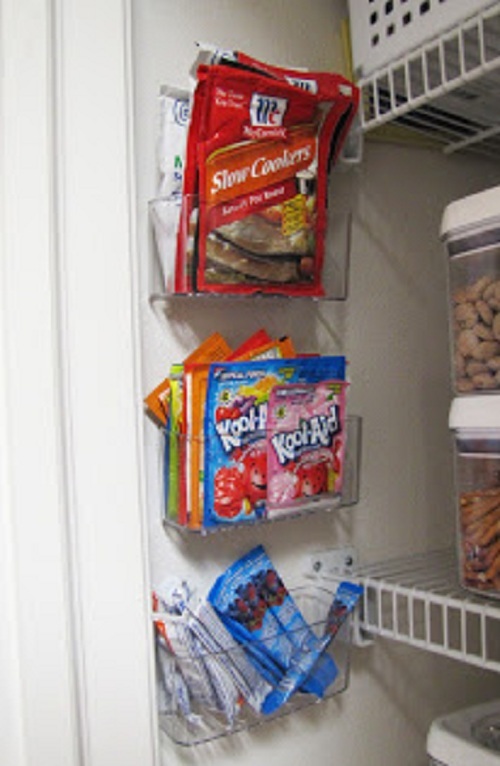 Purchase several inexpensive sink caddies and place them on the wall inside the pantry. This allows for easy access and knowing how much you have left of the item. For more ideas to organize your pantry, visit our Pinterest board, Cleaning the Clutter.